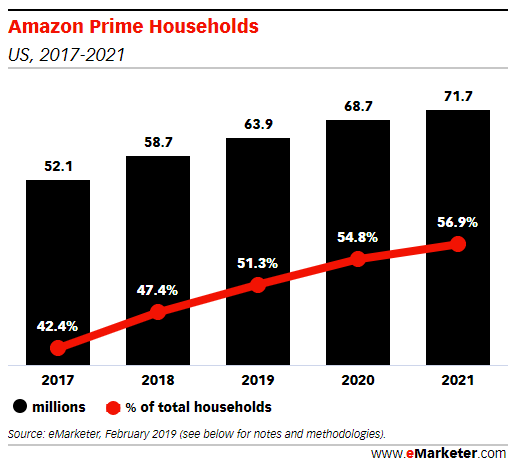 The number of Amazon Prime households in the US will reach 63.9 million this year, accounting for 51.3% of homes, according to eMarketer predictions. The research firm estimates that over a five-year period the number of Amazon Prime homes will have climbed from 52.1 million in 2017 (42.4%), to 71.7 million in 2021 (56.9% of homes). “New membership is driven by the company’s continuous expansion of Prime product categories, like groceries, apparel and pantry – as well as new options for media consumption, like books and video games,” said Martín Utreras, eMarketer’s vice president of forecasting. 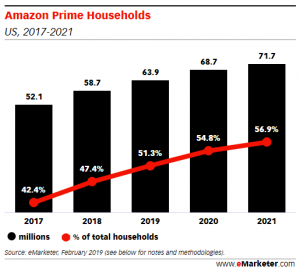 eMarketer said that Prime’s growth will be fuelled by lower-income households and consumers attracted to the platform’s new offerings – despite Amazon raising its annual membership from US$99 to US$119 last year. “Amazon’s flexible discount strategy shows it’s trying to attract the long tail of the consumer market,” said Utreras, referring to Amazon’s various payment plans and discounts, including a US$12.99 per-month option and an annual student membership that costs US$59.